TheFishVet saves a massive red-tailed catfish in trouble! From time to time, fish can go off feed, sometimes for unknown reasons. It is important to start giving nutritional support within 1-2 weeks if fish stop eating. In this case, our catfish patient also developed buoyancy disorder, floating at the top of the tank. 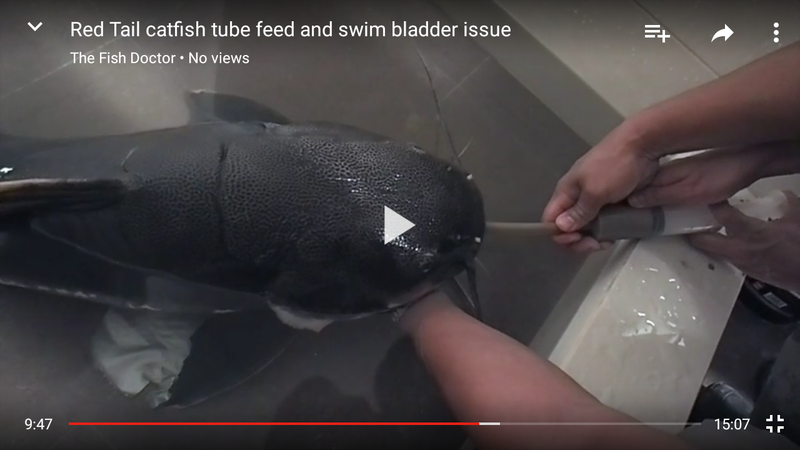 In this video, we demonstrate the procedure for force-feeding fish, and aspiration of excess gas from its swimbladder, along with other medical support. Watch how we do it at this link. Previous Post Fish joke for Monday-itis: melons. Next Post The Fish Vet’s team expands to include a veterinarian in Sydney!